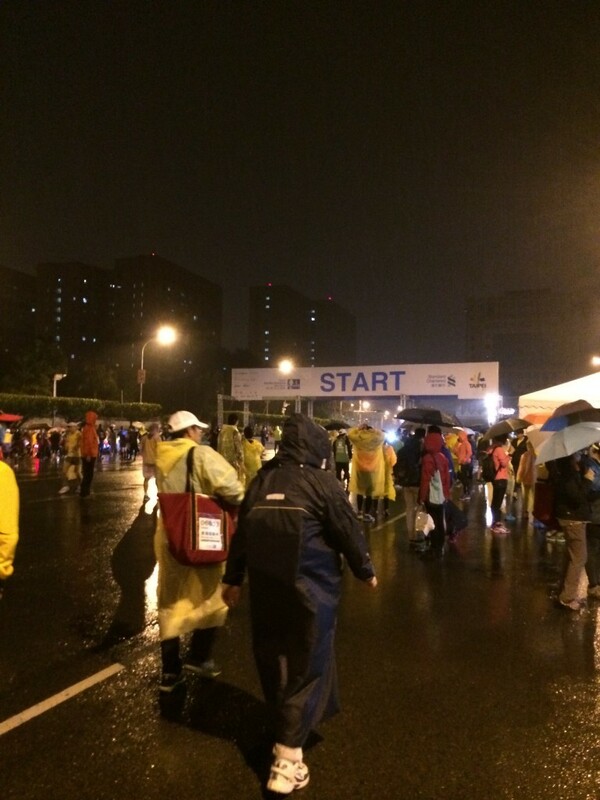 Race Review: Standard Chartered Taipei Marathon 2015 (by 'Elf') | JustRunLah! 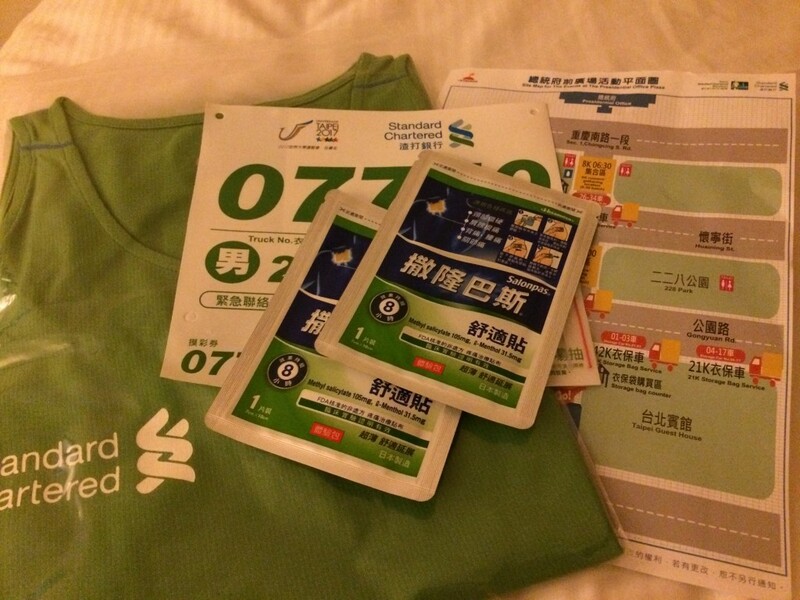 Another One in The Series No surprise here – this is (yet another) review of the Standard Chartered Marathon series – this time round in Taipei. As compared to the other runs in the series, this tends to get lesser attention, at least among Singaporeans, probably due to it’s location(compared to Bangkok and KL) as well as it is rather ‘young’ event(compared to Hong Kong) and also that it gets announced rather late. However, having ventured the other 4 events, I decided to try this one out. Arrived in Taipei on a Friday evening after a 4 hour flight and got a taste of the weather ahead. Even through the aero bridge, I could feel the cold outside – it was still tolerable but it was about 15 degrees. After clearing immigration and customs, headed out to the City Bus counter to get my free ride into the city. 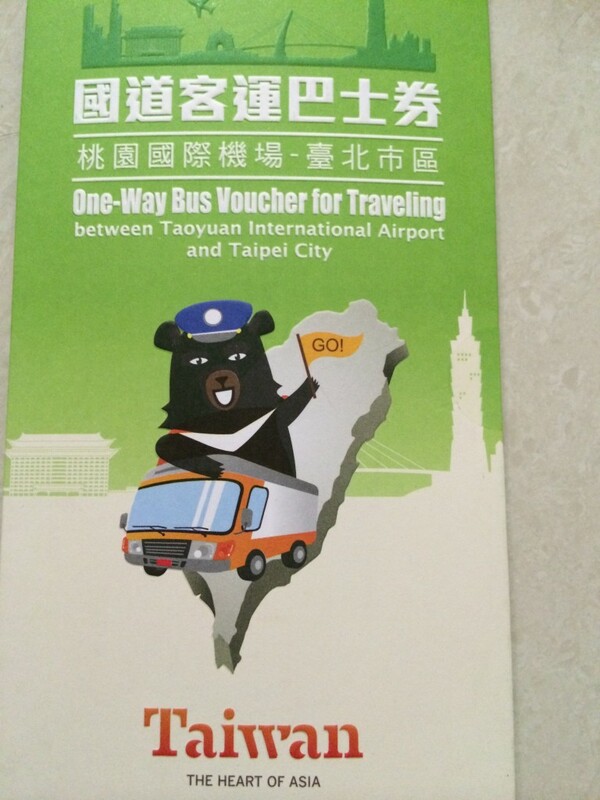 The free ride is courtesy of the Taiwan visitor association – they tend to give out freebies to visitors to Taiwan. Just head to their office at Chevron House with your proof of visit and see what you get. 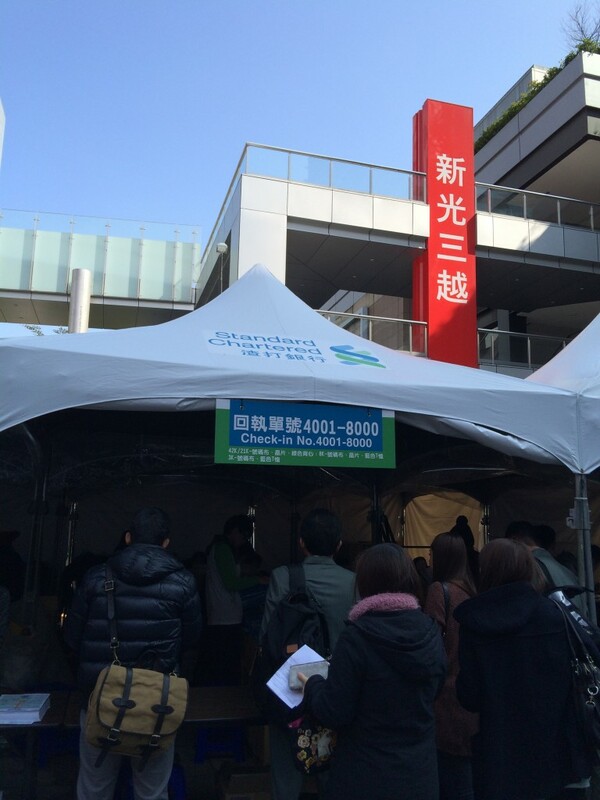 The next day after settling in and lunch, headed out for race pack collection at Shinkong Mitsukoshi. Located near the Taipei City Hall station, this shopping area has a collection of high end boutiques with open walkways where you can find a few street performers. What is rather striking about the race pack collection point is it’s simplicity – it was probably not made up of more of than 16 of the type of tent pictured. 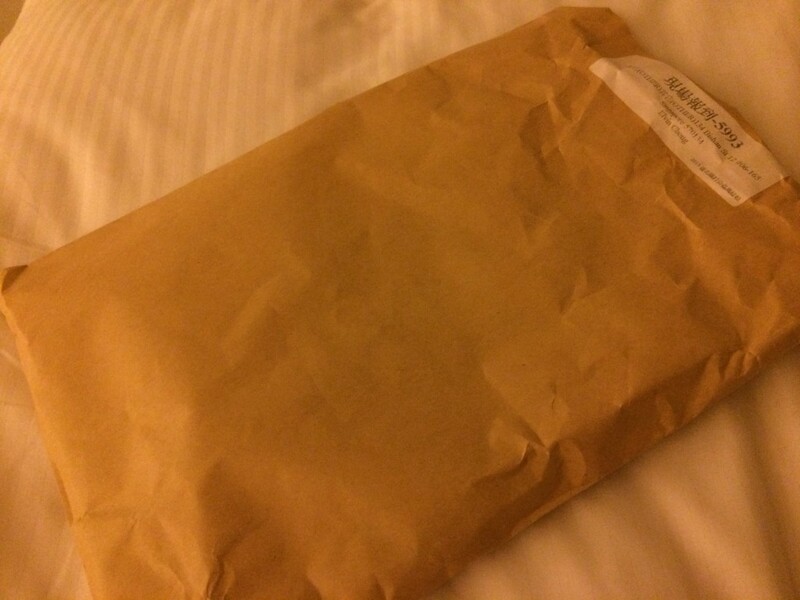 I suppose to match the simplicity – check out the race pack(envelope). It basically contains the bare essentials needed for the run the next day. After collection, we took a short walk to Taipei 101 for lunch. Those looking to do the touristy stuff – just look up and you will know where to head towards. 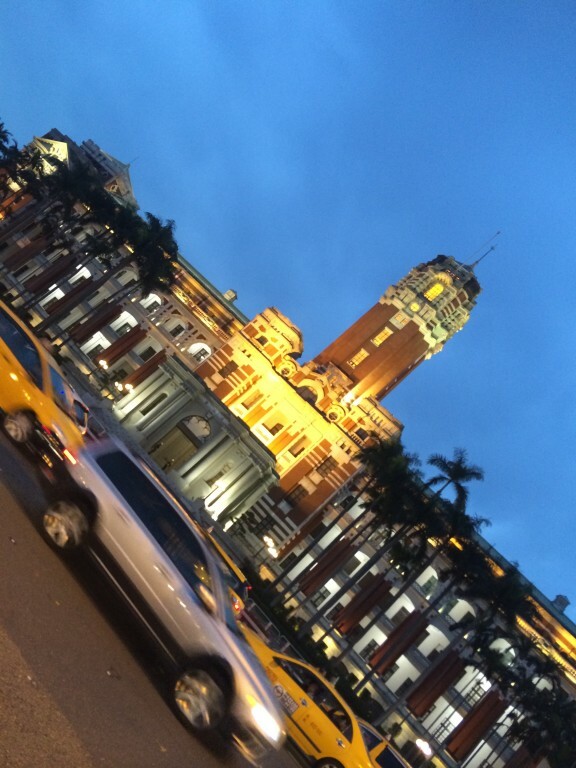 From Taipei 101, it is also easy to head to the Chiang Kai Shek Memorial – the big square. After getting back to the hotel, I took a walk to the start point just to gauge how long it would take me the next morning. After a 10mins walk, I thought I should have reached(and actually I did). But the lack of any set-up, played some tricks on my mind. But after seeing some banners around, I was quite sure this was the start point and headed back to the hotel. Got up at 0345hrs and left the room at about 0415hrs. Once outside, discovered it was drizzling – bringing back memories of the last run I had here in 2009 where it was drizzling as well before start. This time around it was slightly different – it was freezing, despite my 3 layered top! I basically hoped that it would stop. In any case reached the start point by 0430hrs and headed for baggage deposit(which closes at 0500hrs). Not sure if it is a must – but i bought a storage bag for NT100. The bag has a slot for a ‘baggage tag’ which is given out together with the race bib. Runners basically proceed to look for your truck and trolley and hand it over to the volunteers. Spent the next 30mins in the rain trying to keep warm. Runners were then gathered for a warmup which I must add was enthusiastically joined in by most runners – me not included. After warmup, city and race officials as well as sponsors were welcomed up on stage for a few words as well as a one minute silence for the GE235 crash which took just a few days earlier. After the solemn minute, the mood was hyped up again for the start of the race. From flag off, I found the pace to be slightly slow and check on my watch showed that it was close to a 8min/km pace for the first km. Perhaps due to being wrapped up in their ponchos, most runners were not keen to push it and hence(I don’t always get to say this) I picked up my pace slightly and went pass a few runners. 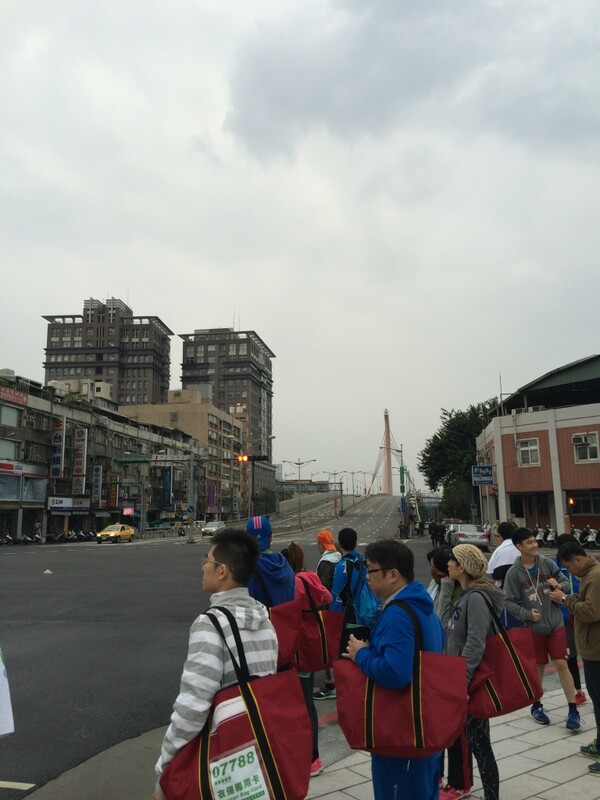 The first slope was encountered at the Zhongshan bridge at about 4km. This was also where the ‘Pee Brigade’ appeared. (It is never easy to hold when you need to go and all you need is one to lead the wee to get the rest started.) Back to the race, it was again relatively flat till the Tiding Boulevard highway where the full and half marathon runners parted ways. Up to the bridge it was again relatively flat with a slight slope up before the u-turn point at about 13km. As I encounter the 3hr pacer, I was abit puzzled as I was looking to a 2.5hr finish. After overcoming my brain freeze, I realised that the slow start had resulted in this overall pace. Nevertheless I told myself to just keep the pace and enjoy the run. From the bridge down, it was back to the streets again before heading to a series of parks along the Keelung River for the last 2km. Around this juncture, the lead runners for the full marathon were also making their way back as well and lead rider had to horn his way through to get half marathon runners to make way. I would think it is pretty frustrating for the lead runners but this is something that they probably need to be prepared for when you have both the full and half marathon runners running together. As mentioned earlier, this race is probably still considered as new and hence may have some teething issues. Credit however must be given to the Chinese Taipei Road Running Association which has been organizing runs and will pick up more pointers along the way. Logistic point of view they are almost there -the deposit baggage is something pretty cool(and a good Souvenir). 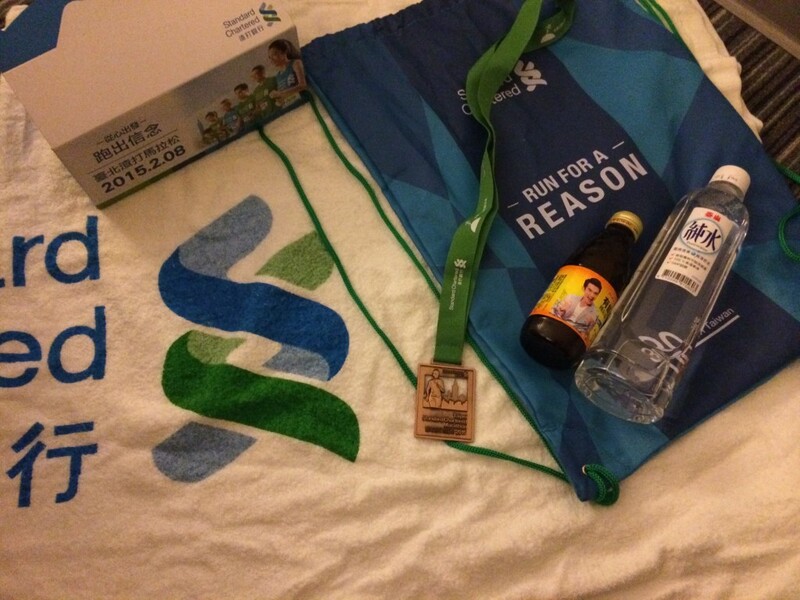 Runners would also probably enjoy the freebies that come with the race. Besides, apart from the run Taipei is a nice place to visit. If you(as always recommended) are able to catch a cheap flight, a couple of friends to join you, you probably can get by with less than $600 for a short race weekend. Hello, thank you for your attention. Came across your article by chance when looking for information on Marathon events in Taiwan. I am interested in signing up for the next (2017 ?) Standard Chartered marathon in Taipei and was wondering if you have any information on when are the likely date the registration opens? Thanks a lot in advance for guidance! Hi Casey, this run is usually held in January or latest early February. Unique thing about the Taiwan runs is that the registration usually starts quite late – I remembered I registered mine in Novemeber or about 3 months before. So do keep a look out (www.scbmarathon.com) from about October and you should be able to get a slot. Alternatively you can sign up for updates from the Chinese Taipei Road Running Association(www.sportsnet.org.tw) and they will will usually keep you in the loop about upcoming runs. Hope it helps! Hi Elf, I’m considering between SCM Taiwan and HK for next yr. Which one would you recommend in terms of the running route? I prefer scenic roads with minimum u-turns (running back and forth along the same stretch of route). Thks! Unless there are changes in the routes, both runs are unfortunately not very scenic 😂. HK is pretty much on a highway but this year’s start did feature more of the streets such as through Mongkok while the usual end sees runners running through Hennesy Road, again through streets where there are people gathered to give support. But do bear in mind that the run on the highway is quite a long stretch(at least 5km in each direction before and after the u-turn). As for Taipei, it is mostly on the streets with a shorter stretch on the highway as compared to HK, with 1 u-turn which veers off slightly afterwards, hence lesser of running along the same stretch. This run does lead you to a run along the Keelung river in the park so that’s where the scenic part kicks in. Perhaps due to HK being a older race, it is probably better organised and does draw a bigger crowd which leads to a more ‘stressful’ registration. Taipei is not too bad and slots are more readily available. Based on your ‘route requirements’, Taipei would probably be the one for you. Im joining the HK Marathon next year and is quite anxious on how to dress-up as I have never run in cold countries before. Is it ok to just wear normal singlet and shorts like Msia/Singapore? Im also worried of over-dressing. Hi Lee, I really don’t think singlets and shorts is a good idea…haha… The 3 times I participated that temperature was below 20 – there was one point which I think it was single digit briefly. Apart from the temperature, the ‘killer’ is the wind so it’s gonna be cold. Even for someone like me who cannot take heat – I was like in 3 layers(Long sleeve top(compression top), singlet and then another t-shirt. Initially I thought of using the tee only at start line and then dump it, but I was glad I held onto it as mid-way I actually put it back on. For bottom, the full compression tights would be good with shorts – by minimum would be running tights(so that it’s not so ‘breezy’). Honestly it will be cold so better overprepare than be underprepared. Worse case is take off the additional layers along the way – might affect timing slightly but better than freezing out of the race. Hope it helps!